A locally developed online marketplace was launched today that allows consumers to set the price they are willing to pay for items. Alphatise allows consumers to name their price, leaving sellers to decide whether to sell at that price, and how many people they are willing to offer the deal. The site has a database of "tens of thousands" of products, including cameras, TVs and other technology items, with the goal of having "hundreds of millions" by Christmas. The site is designed to capitalise on what its founders see as a growing trend for vendors and distributors to sell direct to the public. Vendors aren’t the only target. The site is being pushed as a sales channel for resellers, retailers, distributors, individuals and small companies. One of the site's four co-founders, Ben Nowlan, said that the site aims to facilitate retailers and other channel players as customers move online, describing the site as "complementary" to their existing bricks and mortar or online stores. "The retail distribution channel is still a big part of the way [wholesalers] connect with consumers. But we're already seeing a lot selling direct as wholesalers to consumers right now." “As more users come on board and more wishes are made, we expect more sellers to use Alphatise as another powerful channel to help them sell more goods," he said. 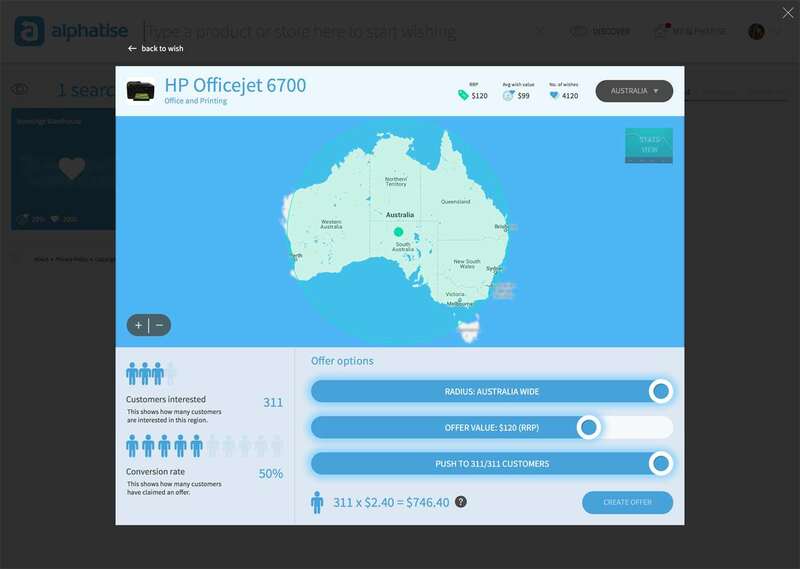 When it comes to vendors themselves, he pointed to the likes of Samsung, Canon and Microsoft which now sell direct on their Australian websites. "They're already evolving this way. It's just a matter of time of time as we start to see more touch points come out of that channel." "I think initially we'll see the channel partner as the supplier. As we open up the marketplace and demand market pressures start to evolve, then we'll start seeing vendors using it as a direct to consumer channel." The Alphatise interface. Click to enlarge. For sellers, the Alphatise site is being pushed as a way to access data on "real time market demand". Screenshots show conversion rates and how many customers are interested in a particular offer. Offers can be pushed to customers in a few suburbs or across the country. "We will be the first platform of its kind that will be able to reflect actual demand for a product," claimed Nowlan. Sellers are charged 4 percent of the product price on sales. For example, if they sell 50 TVs, they pay 4 percent of every product they sell. Nowlan said there weren't any technology channel providers officially registered at launch, but said the company had been in conversation with Australia's "top tier retailers". He said the company will initially contact suppliers directly with requests from consumers to see if they want to meet that demand. Nowlan has formerly worked at Groupon, while another co-founder Paul Pearson is a former managing director of IT&T recruitment consultancy Velocity Recruitment.